These days it’s just another ghost of Glitter Gulch, but there was a time in the 1970s when the Gambler’s Hall of Fame Casino hustled slot players on Fremont Street. It would never match the action at Binion’s Horseshoe Club or the El Cortez, and in a few years a young Steve Wynn would turn the Golden Nugget into the place to be downtown, but it would be hard to match the Gambler’s Hall of Fame for oddity and intrigue. The property at 32 Fremont changed names as often as the Gabor sisters changed husbands. Beginning as the Silver Palace in the mid-1950s, it became the Carousel Casino in 1964. 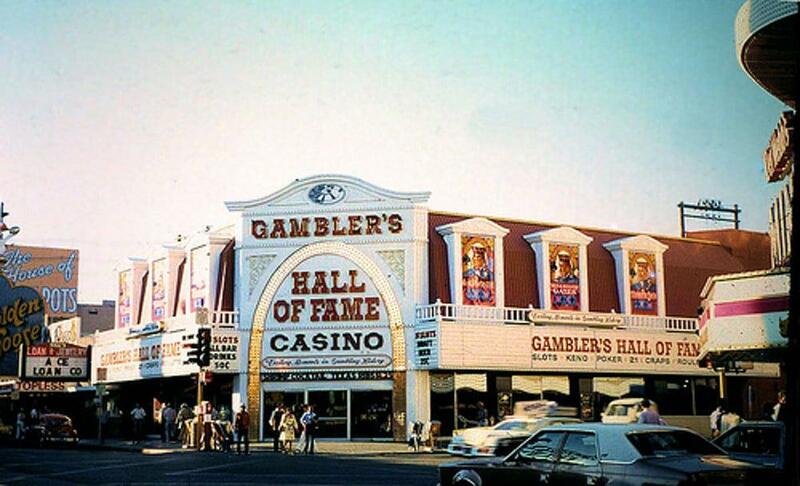 A decade later, it re-emerged as the Gambler’s Hall of Fame. Ownership and signage continued to change through the 1970s and ‘80s: Sundance West, Sassy Sally’s, and in the new century Mermaids Casino. Today, Herb Pastor’s name is probably most closely associated with the property, which was purchased by Derek and Greg Stevens two years ago. That’s good news for the property. In addition to being about as gaudy as it gets, the casino site offers a history lesson about the way Las Vegas operated not so long ago. It was well-lighted in the front, but pretty shadowy behind the scenes. 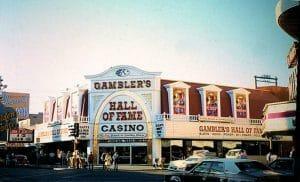 The Gambler’s Hall of Fame was once financed with a $2 million loan from the Teamsters Central States Pension Fund obtained by a well-connected Minneapolis banker and business operator named Deil Gustafson. Born in Iowa, Gustafson rose to prominence in Minnesota politics, real estate and business and served as deputy director of Hubert Humphrey’s 1960 presidential campaign. Of course, Gustafson is better recognized as one of the notorious part-owners of the Tropicana during the 1970s at a time it was being skimmed by the Kansas City mob. Like a lot of things Gustafson touched, those big plans crumbled. And the Tropicana, into which he’d pumped millions, was riddled with scandal. There were marker scams and rampant theft from the casino to the kitchen. Even bigger trouble was on its way. But when he reopened the Gambler’s Hall of Fame, a strange thing happened. He declined to check on his investment. “I spent absolutely no effort or time on it,” he told a reporter. Gaming Control Board agents, however, weren’t as absent-minded. By January 1976, agents had amassed a complaint that ought to have set off alarms throughout state government that Gustafson and everyone he associated with was unsuitable to walk a dog through a casino, much less be licensed to operate one. The little Gambler’s Hall of Fame was festooned with violations. One charge: casino money boxes were opened and tapped by “unauthorized persons.” The money was missing, and Gustafson has the distinct impression that he could offer strangers a piece of the casino without bothering to discuss it with state authorities. He faced a large fine and the revocation of his gaming license. On March 18, the Nevada Gaming Commission accepted a check from Gustafson for $16,402.77 that covered a $15,000 fine and the cost of the investigation. With everything at stake, Gustafson surrendered his license. The Teamsters would be well known for their pension fund loans to Las Vegas casinos, but the $2 million Carousel/Gambler’s loan rarely made headlines. Gustafson, busted out, served prison time in a multimillion-dollar check-kiting scheme associated with mob front Joe Agosto. Gustafson died in 1999. In 2016, the Stevens brothers purchased the property and the old building has been demolished. With big plans and sufficient financing, and what can only be described as a track record of superior ideas, the old Silver Palace-Carousel-Gamblers’ HOF-Sundance West-Sassy Sally’s-Mermaids may shine anew.